If a uniquely American and slightly eccentric fall festival in North Carolina,Texas, Wisconsin, Maine or Vermont is your idea of a fun fall getaway, read on. Autumn is the time to harvest some of the many free activities and discounted hotel rooms offered in small towns across America. Whether you combine a stay deal with apple harvesting at u-pick farms, Indian Summer photography, fall foliage viewing, film festivals or museum openings, we encourage travelers to exfoliate that sinking back-to-school feeling with fun activities. 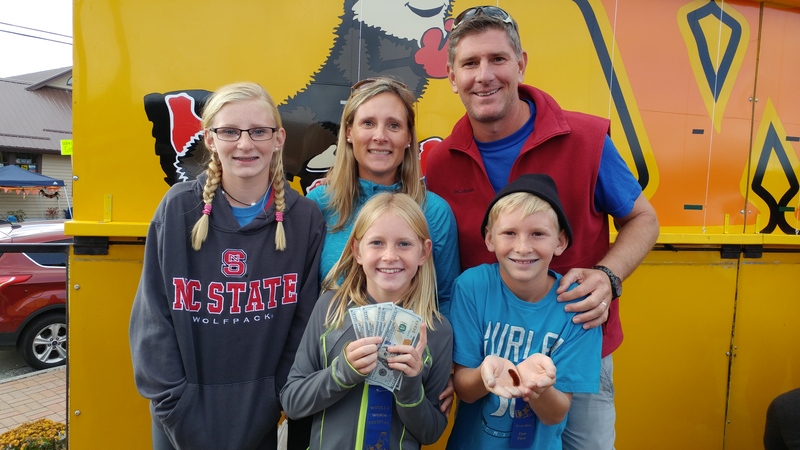 Cash prices are awarded for the fastest climbing caterpillars at the Woolly Worm Festival in North Carolina. The third weekend of October for the past 41 years, Banner Elk has been home to a wriggly event featuring Woolly Bear Caterpillars. The Woolly Worm Festival typically begins at the local high school, where contestants bring their pets. Then around the festival’s daily opening of 9am, or as soon as the first heat (20 worms) is registered and running, the famous woolly worm races begin. These fuzzy caterpillars race up three-foot strings and the champion worm and trainer are crowned (and paid!) The winning worm’s 13 brown and black stripes are interpreted to predict the weather forecast for the coming 13 weeks of winter. Expect about 1,000 racers plus 150 craft and food vendors, serenaded by local talent. The charming town of Banner Elk, Avery County is between the local ski areas at Sugar and Beech Mountain near the Tennessee border. Locals call it the High Country and mid-late October is the height of leaf peeking in the region. Advanced recommendations are in order for this period, and the pet-friendly Best Western Mountain Lodge at Banner Elk offers moderately-priced, spacious double rooms. Another inn we liked is actually a small condo with apartment like units, that serves afternoon tea, bedtime snacks and popcorn in between. It’s called Little Main Street Inn and is located on the town’s main street. 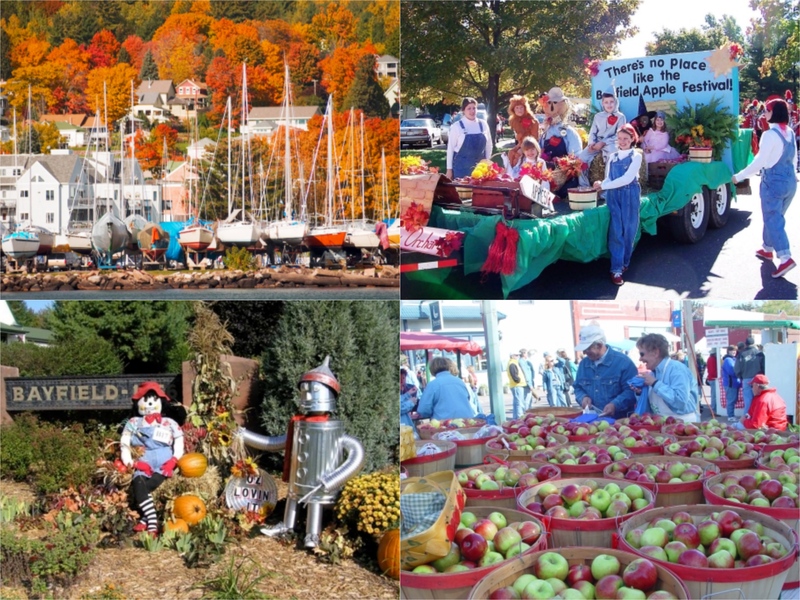 The whole town of Bayfield, Wisconsin gets involved in the annual Bayfield Apple Festival. True apple picking aficionados will recognize Wisconsin for its first-rate Gays Mills apples, honored at the 1905 New York Apple Show and highly regarded ever since. Although Gays Mills is still the most concentrated orchard region in the Midwest, we’re sending you north to the scenic fishing village of Bayfield on Lake Superior, where residents have celebrated the Apple Festival for more than 55 years. For three days in early October, orchard tours, an apple-peeling contest (imagine a record 311″ peel?) and every conceivable apple product are on show. It’s considered among the Top 10 Autumn Festivals in North America and draws up to 50,000 visitors. Fifteen local growers set up roadside stands to sell frosted apples, pies, strudels, cider, apple sundaes, apple jam, apple butter, apple bratwurst, apple dumplings, and more; other festivities include country dancing and carnival rides in this very family-friendly affair. Kids of all ages can participate in a midway packed with games and rides, and the whole family will enjoy the closing day’s grand parade featuring a 400-piece band. Bayfield is on the outskirts of Chequamegon National Forest. Watch hemlocks and maples change color before your eyes on some of the most scenic roads in America. The Hayward to Glidden route is especially spectacular. Those traveling after mid-month should concentrate on the Kenosha and Elkhorn regions near Milwaukee, where fruit and foliage ripens later. If you’re going to make a real vacation of this visit, the lakefront Bodin’s Resort in Washburn is popular and quiet. The resort, founded in 1938, has four well-kept one and two-bedroom cottages overlooking Lake Superior and five of the Apostle Islands. Families will enjoy the large lawn area for playing and the surprisingly nice sandy beach. By the way, your four-legged relatives are welcome here, too. For a more sublime and eco-friendly stay, try the historic eight-room farmhouse called the Pinehurst Inn. This place has been recognized for its sustainable and energy-efficient practices and gives some of that energy back to guests with its fine spa, locally grown cuisine and attentive service — and it’s a bargain in the fall. For more accommodations information and a 24-hour foliage report, contact the Wisconsin Board of Tourism. 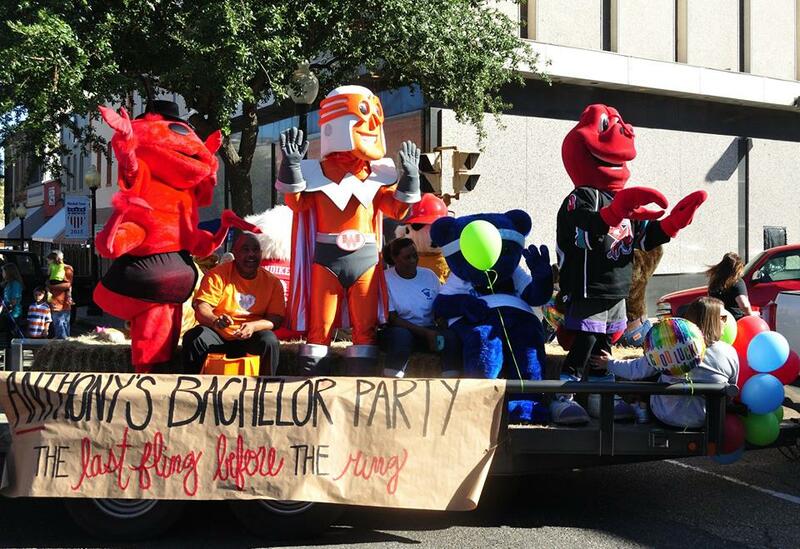 A big parade and wonderful costumes are highlights of the Marshall Fireant Festival in Texas. You have to give the 25,000 residents of Marshall in east central Texas some credit for their sense of humor. Anyone who’s sat on one of those springy verdant lawns carpeting Austin, Dallas, or Houston has probably known (in the Biblical sense) a Texas fireant. These incredibly ferocious pests are feted annually the second Saturday in October at Marshall’s FireAnt Festival. The 36th Annual FireAnt Festival (October 13, 2018) will have a free concert and dancing, petting zoo and kids activities. Fun costumes, a parade, the Tour de FireAnt bicycle race, and the awarding of FireAnt King and Queen scholarships to local highschoolers should engross your family. Your family can enjoy long walks through the city’s large historic core of 19th- and early 20th-century Western houses, or visit nearby Jefferson, Texas and Shreveport, Louisiana. Search the Greater Marshall Chamber of Commerce for other events occurring during your stay. There’s a La Quinta Inn & Suites Marshall with a fridge and microwave in the rooms, plus pool, laundry facilities (in case anyone gets ants in their pants) and complimentary breakfast included in budget rates. The contemporary Comfort Suites is another choice in South Marshall with similar facilities. 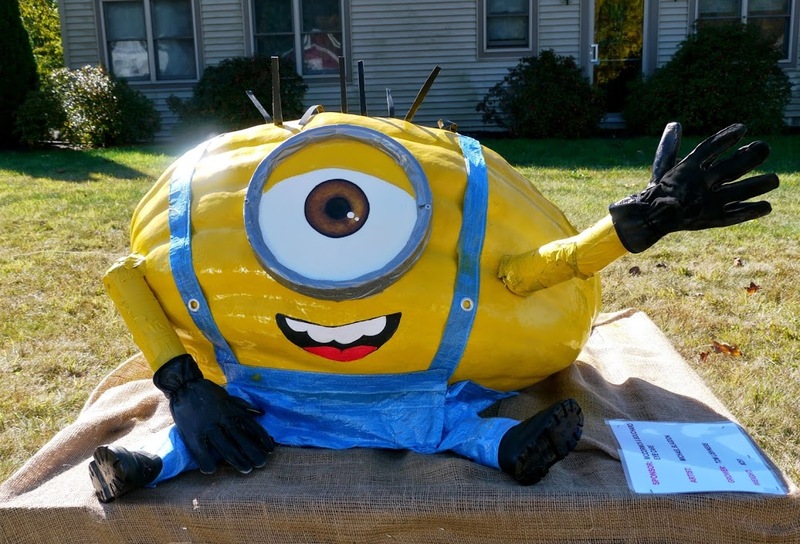 Artistic pumpkins are the highlight of the Damariscotta Pumpkinfest and Regatta in Maine. It may be known as the Pine Tree State, but Maine still has plenty of fall color to go around the 17.7 million acres of woodland. Plan to visit the Boothbay region, where your family can check out the annual Maine Fall Foliage Festival, now in its 51st year. The event takes place over the three-day Columbus weekend and features arts, crafts, great food, local entertainment, children’s activities and steam train rides sponsored by the Boothbay Harbor Region Chamber and the Boothbay Railway Village. This coastal village reflects Maine’s long sea-faring history, has many local watersports and boating options, and is very picturesque. While there, don’t miss the fabulous pumpkin art at the Damariscotta Pumpkinfest and Regatta nearby. The waterfront Boothbay Harbor Inn is good place to stay, with spacious rooms where kids under 12 stay free, and rates that include breakfast and WiFi. Every autumn during September and October, the super-family-friendly condo complex at Smuggler’s Notch celebrates AutumnFest. If getting away means hiding yourselves at an organized resort on 3,000 forested acres, Smuggler’s Notch may be perfect. You’ll get 50% off supervised activities for children 6-weeks to 7-years-old in KidsConnection, plus free guided hikes, use of The Ozone at the FunZone 2.0, Disc golf and mini-golf, biking, scavenger hunts, use of the skate park, indoor tennis, water slides and heated swimming pool and the more traditional resort sports like shuffleboard. All vacations with a minimum three-night stay earn a 4th night free, too. Comfortable, modern lodging ranges from furnished studios to five-bedroom condos, all with kitchen facilities (including cookware and utensils). This award-winning mountain resort, surrounded by state forest lands, is located about 45 minutes’ drive from the Burlington Airport or two hours south of Montreal. Late-September/early October should present peak foliage according to (Vermont Tourism ) in the scenic Green Mountains.